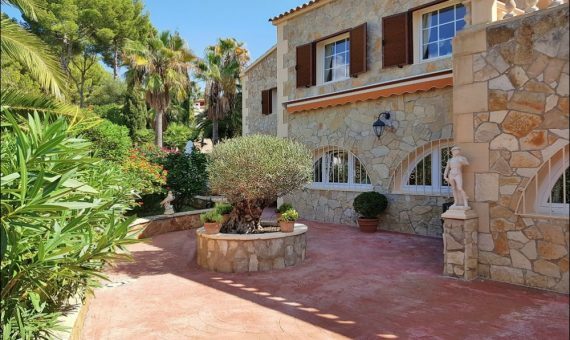 Wonderful house in a quiet residential area of Nova Santa Ponsa, prestigious and modern location in south west part of Mallorca. The fenced plot of 1.270 sqm offers various fruit trees, a well-kept garden, a large swimming pool and a beautiful house with living area of 420 sqm, which is divided into living and dining room, separate bright kitchen, 5 bedrooms, 4 bathrooms (1 en suite) and a dressing room. There is also a garage and a wine cellar. The villa is in excellent condition and is equipped with central oil heating, air conditioners, 2 fireplaces, BBQ, storage room, automatic irrigation system, fitted wardrobes, elevator and alarm system. Luxury Port Adriano is a few minutes from the house. Also the center of Santa Ponsa is near, the capital of the island, Palma, can be reached in 15 minutes by car.